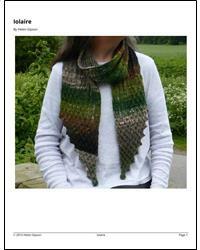 A light summer scarf incorporating simple cables and columns of fagot lace. Although it is not reversible both sides are attractive with different textures. The even row side has the deep texture of the cables, the odd row side is smooth and really showcases the lace columns. Iolaire is Gaelic for golden eagle, which has a wingspan of between 6 and 7.5 feet. The scarf will block to over 6 feet long and from 6.25-9 inches wide to really open up the lace if desired.